Tully's signature K-Cup pack blend features three flavorful Central and South American coffees. 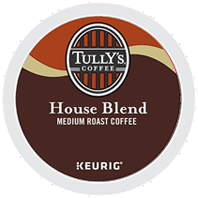 Tully's House Blend is smooth and bright with medium body. This coffee boasts a nutty start and beautifully balanced fruit and spice tones. A delightful blend anytime. 96 Count $59.00 $57.00 On Special!